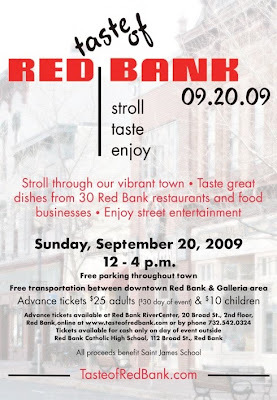 I told you last week that I fell in love with Red Bank, New Jersey and that I might go back for the Food Festival...so, I wanted to remind all of my JetSetSmart readers that the Taste of Red Bank Food Festival is tomorrow between 12-4pm. Basically, all of the amazing restaurants in Red Bank will put their best feet forward and put out some of their most delicious dishes. It's supposed to be beautiful weather-wise tomorrow...so if you have nothing else going on, it might be fun to check out! P.S. Sorry this post is so short today, but I am busy working on JetSetSmart. It should be a great place for you to go and download travel guides for Jet Set Smart destinations. But, it's a lot of work!!! Hopefully all of the hard work will pay off. I can't wait to get it up and running for you guys...stay tuned!